Bill Hybels is the founding and senior pastor of Willow Creek Community Church in South Barrington, Illinois, one of the largest and most influential churches in North America, and the chairman of the board for Willow Creek Association. He convened The Global Leadership Summit in 1995, following a God-given prompting to help raise and develop the spiritual gift of leadership for the local church. Both visionary and passionate about seeing every local church reach its full God-given potential, he speaks around the world on strategic issues related to leadership, evangelism, and church growth. An exceptional communicator, he is a best-selling author of more than 20 books on personal evangelism, marriage and especially on the subject of Christian leadership, including Just Walk Across the Room, Courageous Leadership and the newly released, The Power of a Whisper: Hearing God and Having the Guts to Respond. 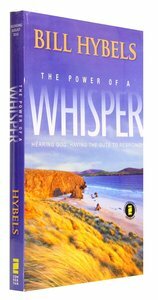 Customer Reviews For "The Power of a Whisper"